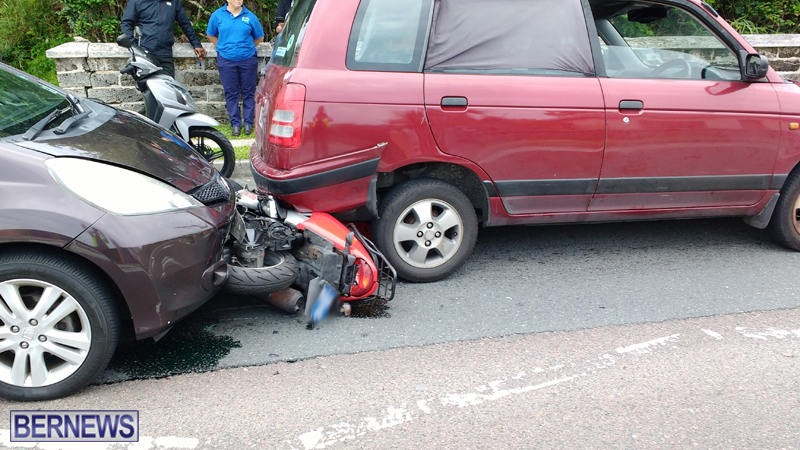 [Updated] A collision involving two cars and a motorcycle occurred this morning on North Shore Road in Hamilton Parish, with the motorcycle ending up wedged between the two cars. Police, fire and ambulance personnel attended the scene, and further details are limited at this time, however we will update as able. 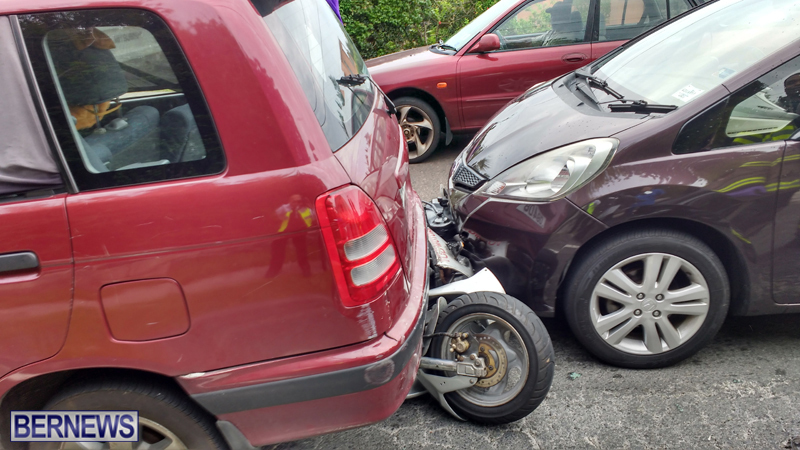 Update 11.34am: A police spokesperson said, “First responders attended a report of a road traffic collision that took place at 8:30am this morning [Tuesday] on North Shore in Hamilton Parish in the area of Radnor Road. What’s the difference if its a tourist bike or a local bike, person got injured that’s what’s important. Hope the person is okay. Granted, any injured person is worthy of concern, however locals know what they are getting into every day they ride their bike on the roads. Tourists, unfortunately, are singularly unprepared for the volume and velocity of vehicles on the road, not to mention the attitude of the drivers, which is aggressive more often than not. As such, a tourist involved in a collision like this would be far more surprised and shook up than a local. That is the difference. It’s a blue license plate… not white..
Really? Some of you are worried about the colour of the plate? What planet are some of you from? Bikers finding themselves stopped directly behind a car will always risk being the meat filling of that sandwich. Cagers open your eyes and put down the phone!!! Slow the feck down and pay attention! Hope it’s not a tourist’s bike ???? Really ??? You just can’t fix stupid. Hope WHOEVER was on the bike is okay. Thank you “Boston Baked Bean”..Um more concerned about the whereabouts of the rider and whether the rider was okay, not WHO the rider was. Yoo lott arhgue bowt arryting. what’s with this STUPID language? Indirectly relating to the stupid comments.. 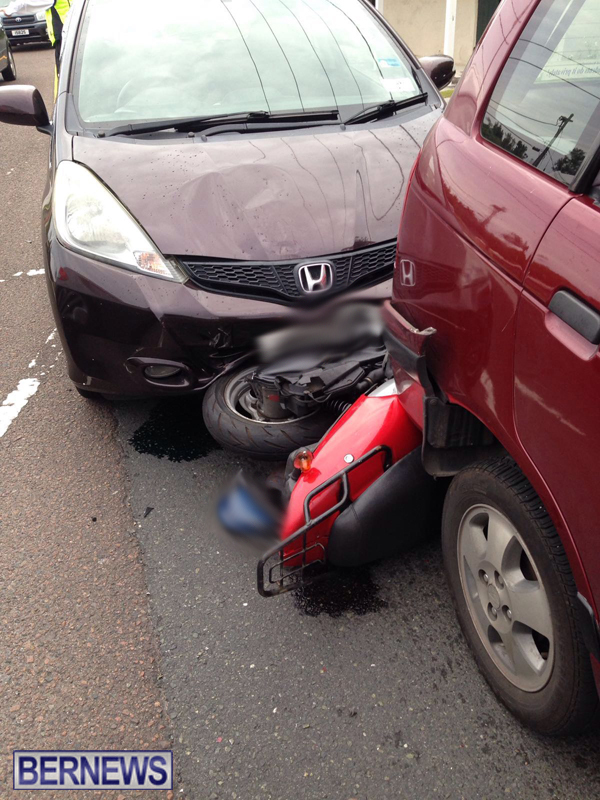 I passed this accident this morning my first thought was I hope that bike rider made it…. the article says minor injuries someone is very lucky ! And what about the idiot that rear-ended them? @Poo Bear: No, no, no! You have it all wrong. 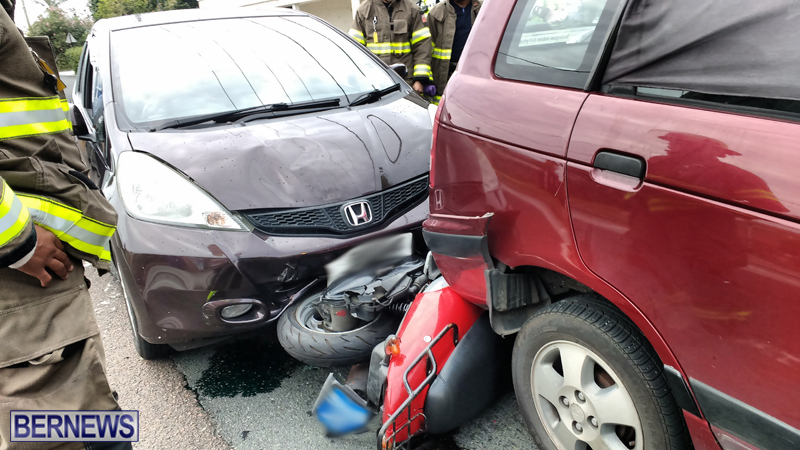 The red car and the motorcycle reversed into the front of that dark car. clearly this person jumped off their bike because the cylce is definitely UNDER both vehicles… how on earth did this happen? can we get the CC TV footage please Bernews?! I truly hope you’re right. They shouldn’t report it as minor injuries, if this person was crushed. Crush injuries can appear minor to begin with but can result in everything from kidney failure to amputation of a leg. Hoping they’re okay. When will people learn to keep proper distance?? The car at the back is clearly to blame here. 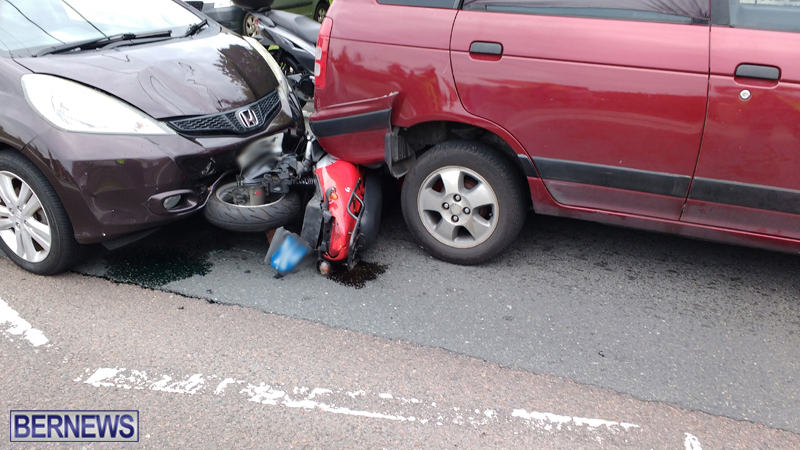 Perhaps another incident of a bike rider third-laning and squashing themselves into non-existent stopping distance? Or the front driver stopping to let someone out of a junction? Or the car driver behind the bike was on a cell phone? There you go. A possibility for blame in each instance. Someone was at fault. Someone could have been killed. They weren’t. So first of all, we should be thankful. Secondly, I would suggest that there is there considerable educational benefit in publishing the causes of our non-fatal road accidents, when determined. Agreed..we never hear what happened. Glad the rider is safe. Its amazing that on every accident post people jump to conclusions and then attack each other. It is easy to figure out. 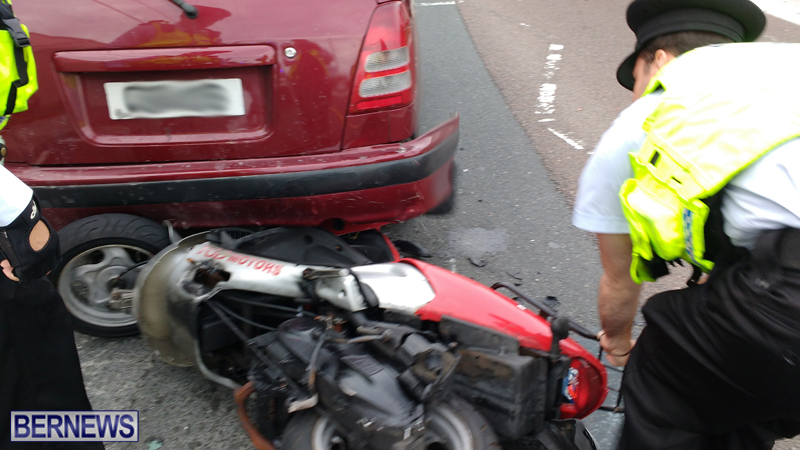 One car was stopped, the bike stopped behind it. Rider heard screeching of tires, jumped out of the way scraping his limbs on his fall to the ground. Pay attention while driving people. The bike rider is very lucky to have suffered just minor injuries in this smash up. Txting and driving maybe? I hope not.